T-Mobile G2 Review - Learn everything you need to know about the T-Mobile G2 before you buy. 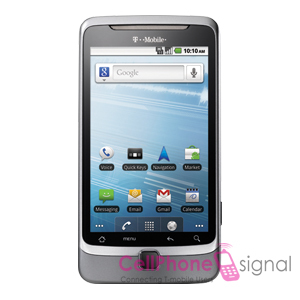 -The T-Mobile G2 is a great phone all around. If you are looking for a great texting experience with a physical QWERTY keyboard, this is it. The G2 handles Android 2.2/Froyo really well, however there is a bit of unnecessary software that comes pre-loaded on the phone. The 5 MP camera functions really well and the G2 gives you the option to shoot video in 720p (HD). This phone definitely isn’t for the beginner, but any advanced user that loves Android will love this phone. -The aesthetics of the phone are great. Simple and metallic HTC did a great job making this phone not feel cheap in the least. The slide out QWERTY keyboard works marvelously, however, the phone does not switch from portrait to landscape on the home screen unless you pull out the keyboard (hardly an annoyance). The 800 X 480 3.7-inch LCD screen puts out great color and provides plenty of room for all your widgets and folders. With the optical trackpad at the bottom giving you another option to change home screens with. I actually prefer this option because it works so well. -The camera on the phone takes great pictures but not as great HD video as some other phones. The microphone is a little over sensitive, but that’s not a huge deal. It has a really cool speech to text feature that actually works really well. Not being a huge texter, this option was really nice. There are plenty of great options in the Android market for apps making the phone highly customizable just like any other Android device. -We had a great experience with the battery in our phone. Although there are quite a few users on both sides of the argument, the majority of people we talked to had a great experience. -The G2 comes with 3 customizable buttons on the QWERTY keyboard that you can assign to anything you like-mail, new text message, Twitter…etc. It also has a dedicated “.com” key which came in really handy. It comes with Wi-Fi, Bluetooth, and GPS. Unfortunately, the phone does not allow you to create a hotspot or use tethering. "My experiences with PaceButler has been great, my representatives are always willing to help in any way they can to make our fundraisers successful, I'M PROUD TO WORK WITH A GREAT COMPANY THAT CARES ABOUT OUR ENVIRONMENT, AND GIVES SUCH GREAT SERVICE."